Mega Sale! Save 22% on the MiniOwls Multipurpose STORAGE CHAIN - White TOY ORGANIZER with 20 Clips for Home & Store Display. Easy Way to Exhibit Plush Toys & Accessories Like Hats by MiniOwls at Indsight. MPN: 1. Hurry! Limited time offer. Offer valid only while supplies last. MiniOwls Storage Chain is an ideal way to neatly organize plush animals, costumes, pet toys, collectibles, caps, scarves & other accessories. MiniOwls Storage Chain is an ideal way to neatly organize plush animals, costumes, pet toys, collectibles, caps, scarves & other accessories. WE DARE YOU TO USE YOUR IMAGINATION! WHAT WILL BE YOUR NEXT WAY OF USING IT? Show us your ideas through review or via our website. CLICK "ADD TO CART" BUTTON AT THE TOP OF THIS PAGE AND BECOME ORGANIZED NOW! 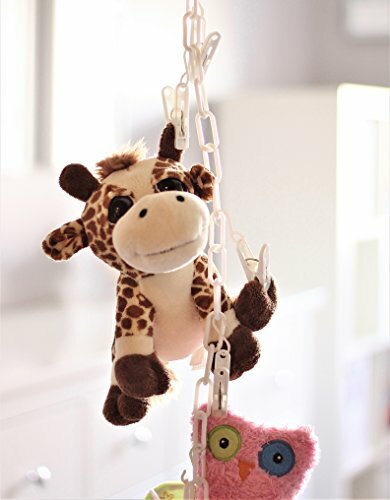 ★ TOP RATED STORAGE SOLUTION ★ for stuffed animals, plush toys, accessories and other collectibles. Install this Storage Chain to be clutter free. ★ GREAT EDUCATIONAL TOOL ★ that teaches kids organization skills and responsibility necessary for lifelong success and productivity. ★ INEXPENSIVE & DECORATIVE DISPLAY★ This nicely polished white chain fits every décor & creates extra storage space in any home, store and office. This strong chain is made with durable but very light in weight materials which gives it a super-long life & a proven customer satisfaction. ★ EVERYTHING YOU NEED ★ to start using it is provided: chain, 20 clips with hooks, mounting that allows to hang it horizontally or vertically and a free of charge rod hanger that will help discover new & instant ways of usage. ★ BUY WITH CONFIDENCE ★ from a known and trusted company ★ MiniOwls Inc. has 2500 POSITIVE CUSTOMER REVIEWS & FEEDBACK ★ and a Lifetime Quality Guarantee with 'no questions asked' return policy. If you have any questions about this product by MiniOwls, contact us by completing and submitting the form below. If you are looking for a specif part number, please include it with your message.